baby corn manchurian is an excellent starter of fried batter coated baby corn stir fried in a spicy, sweet & umami indo chinese sauce. rinse the baby corn in water. chop them if they are slightly big. in a bowl mix all the dry ingredients listed under the batter ingredients except for baby corn and oil. 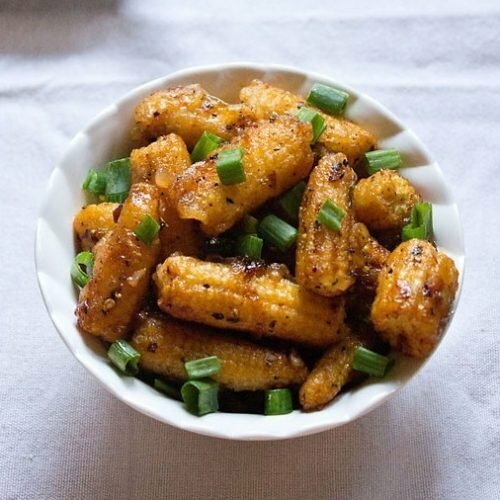 dip the baby corn in the batter and coat them evenly. shallow fry the baby corn till they are golden brown and crisp. add the spring onions and stir fry till they become transparent. add the ginger, garlic, green chilies and celery. stir fry for a minute. now add the soy sauce & tomato sauce. stir and mix well. add the fried baby corn. stir and season with salt, sugar, pepper & red chilli powder. stir again till the sauce coats the baby corn evenly. please note i have not added any capsicum to the manchurian as i did not have them. the amount of sauces and spice powders can be adjusted.